“ Free Holistic Energy Feasibility Study” for your Building. We perform a complete “Holistic Sustainable Overview” on your building in which we can help reduce your day-to-day operating costs, control your raising utility expenses, and increase your profit margins without extra costs. Save Operating Expenses without Capital Expenses. We review the building’s energy consumption. Create a customized energy plan for the best combination of renewable energy sources and building upgrades. If you agree with the solar plan, a development agreement is signed. 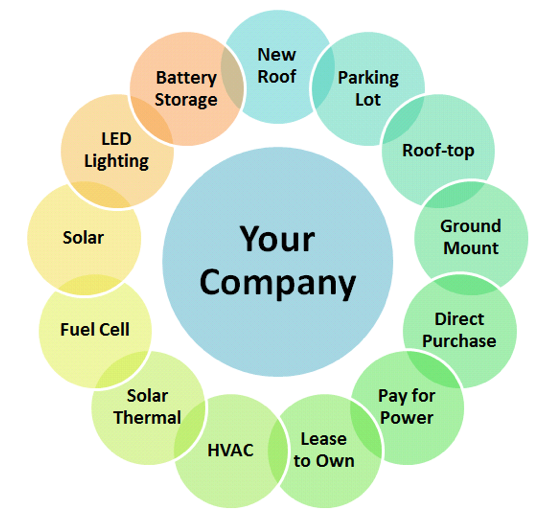 We finalize design, cost and financial options for your commercial solar project. Engineering, Permitting, Procurement and Construction of the upgrades and the commercial solar project. We can implement operations and maintenance.